The bakeries and cafes of Britain have in recent years seen an influx of interlopers. I speak of the brash, brightly-coloured cupcake, huge in size and piled high with whipped buttercream icing. The thing that really gets me is just their sheer size. 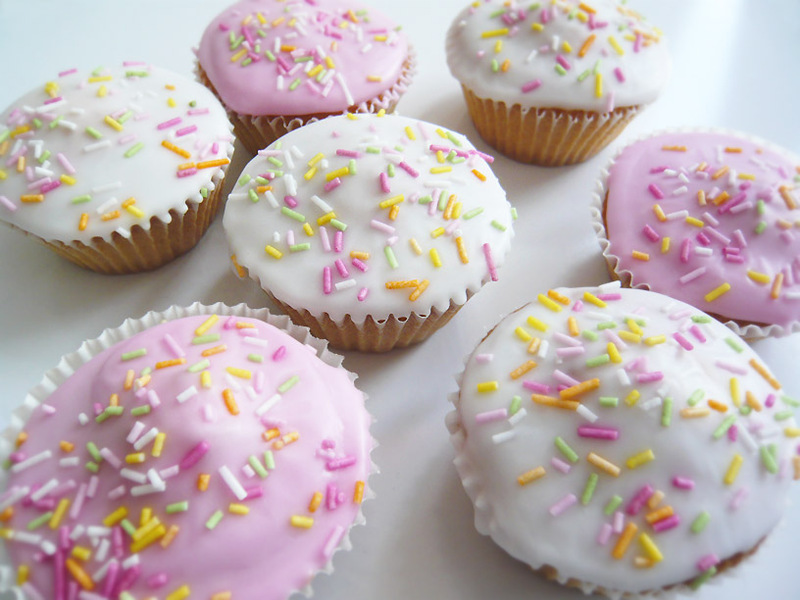 The traditional equivalent in Britain is the much more dainty “fairy cake”, usually decorated somewhat whimsically – coloured sugar sprinkles, which we call “hundreds and thousands” – but not quite as outrageously as their American cousins. 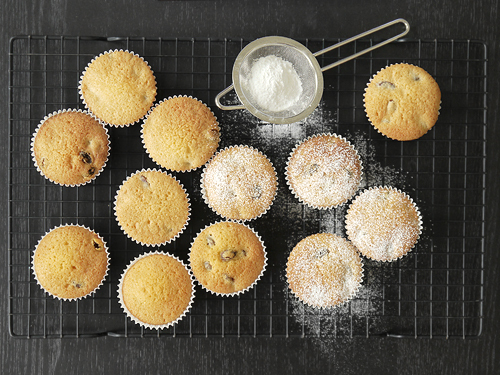 Whereas American cupcakes flaunt their whipped, sweet topping – which often seems to exceed the volume of the supporting cake – fairy cakes make do either with just a touch of simple buttercream frosting (made with just butter and icing sugar, so much less sweet too) or, more usually, simple glacé icing (icing sugar plus a little hot water to bind). If you don’t fancy hundreds and thousands, add a single glacé cherry. Small children tend to look at these as if they are the height of sophistication. The big advantage of being a more dainty cake creation is that they are also far more suited to an afternoon tea. Part of the ritual is that you are able to enjoy your cuppa with a selection of savoury and sweet goodies. As such, you can quite happily tuck into a few sandwiches, with or without crusts according to taste, then enjoy a fairy cake, before moving on to scones, a sliver of chocolate cake or whatever else is on offer. Try doing that after eating a whole American cupcake(*) the size of a plate! Preheat the oven to 180°C. 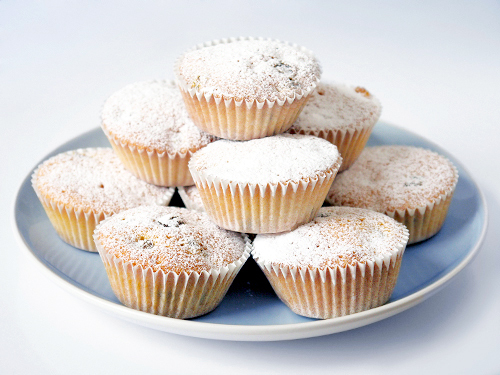 Line a muffin tin with cake cases. Cream the butter and sugar until light and fluffy (until it gets lighter in colour). 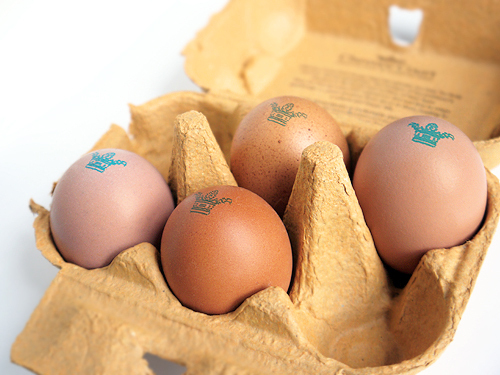 Add the eggs, one at a time, beating well after each addition, and then add the vanilla and salt, and stir well. Fold in the flour, and finally add enough milk to make a light batter that drops off the back of a spoon. Divide the mixture between the cake cases, and bake for 20 minutes until risen and golden. For the icing: combine 150g icing sugar with 2-3 tablespoons of boiling water (plus any colour, if using) to form a thick paste. Top each cake with the icing, and immediately cover with some sugar sprinkles (the top of the icing dries very quickly, so don’t wait until you have iced all the cakes before adding the sprinkles, or they won’t stick). Worth making? Yes. These are quick and easy to make, and always seem to be popular. The cake itself if light and moist, and works well with the simple icing. A change from the excesses of giant cupcakes! (*) Nothing against American food, it’s just that I can’t get over the size of their cupcakes!